Semi-Automatic Double Head Miter Saw 16″ (400 mm) with Digital Read-Out. 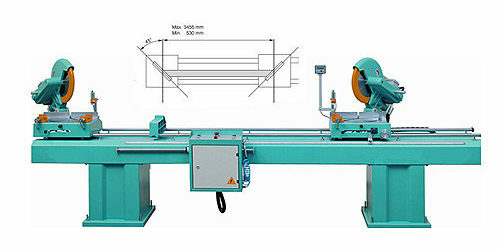 Semi-automatic miter saw with two circular saws designed for flat or angled cutting of vinyl, aluminum, and wood frames. The forward movement of the saw is hydro-pneumatic, and its speed can be adjusted accurately for the frame material. The clamps are pneumatic with safety features. The left cutting unit is fixed in its position, and the right cutting unit is moved manually to its position. The right cutting unit has a pneumatic braking system, and when the braking key is “OPEN”, the machine will not work for safety reasons. The distance between the cutting heads can be adjusted accurately by a digital reading system. The cutting in 0, 15, 22.5, 30 and 45-degree angles is achieved by a switchblade, and in other angles an accurate free cutting is possible.